“A Week Without Worry!”… “Mirth Will be King for Carnival Week.” These were some of the slogans used to describe the first Canadian National Winter Carnival—otherwise known as the Ottawa Winter Carnival—of 1922. This was no tame affair. 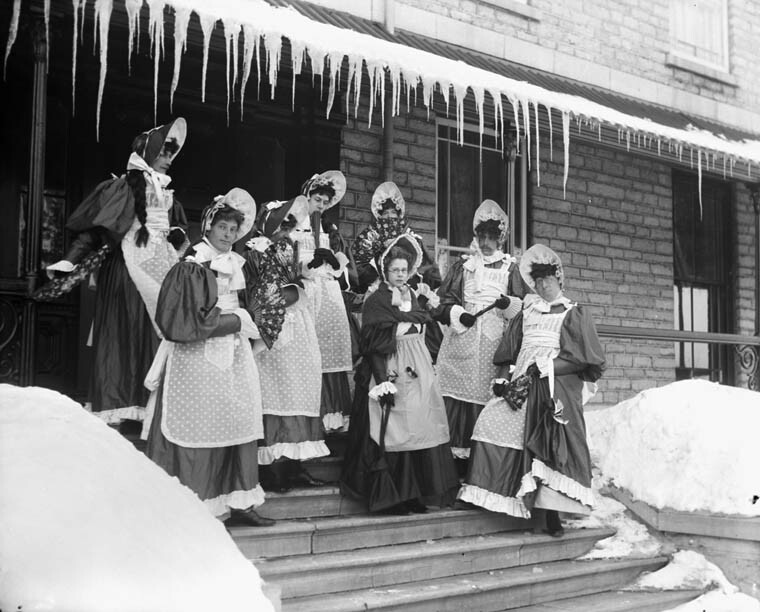 Instead, for a week at the end of January and early February 1922, Ottawans partied—and even went foolishly wild. The 1922 Ottawa carnival was the brainchild of stock broker and mayor, Frank Plant. He organized everything within a matter of weeks. 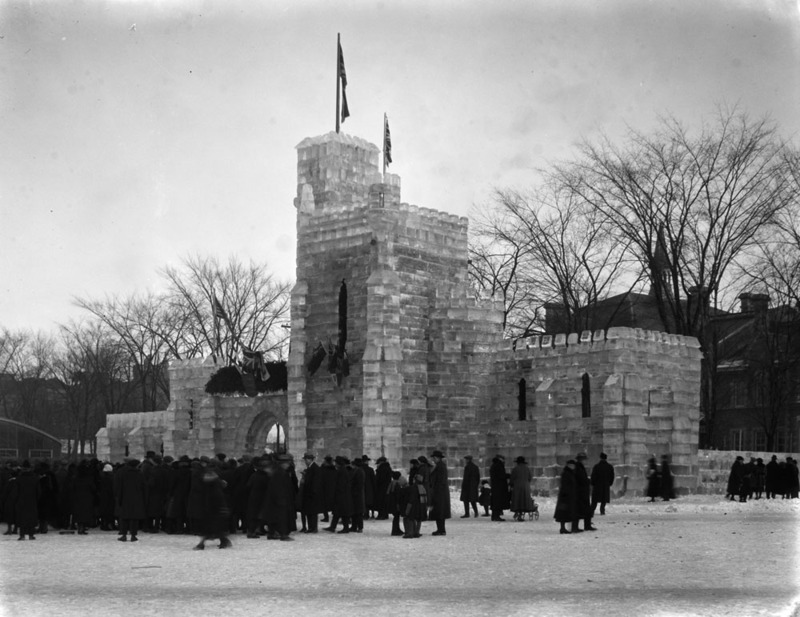 Lord Byng, the Governor General, was asked to open the festivities, which he did outside the Château Laurier on Saturday, January 28, 1922, with 10,000 people in attendance. Although prohibition was in effect in the province of Ontario, alcohol was still legal in neighbouring Quebec. And with the exuberant party atmosphere, authorities turned a blind eye to the reveling hordes travelling back and forth across the river from Hull (now Gatineau) with bottles of booze. There were three major attractions. 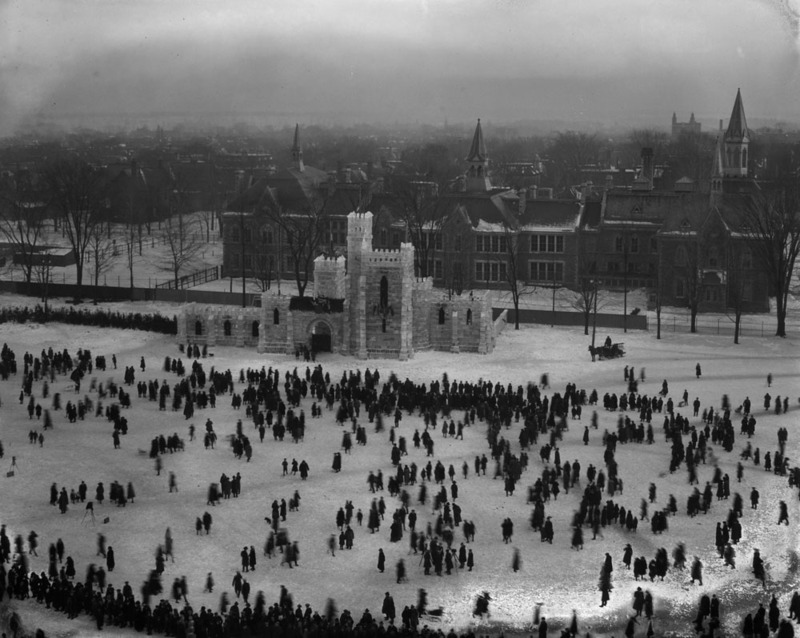 The first was the 22-metre Ice Palace located at Cartier Square on Elgin Street. 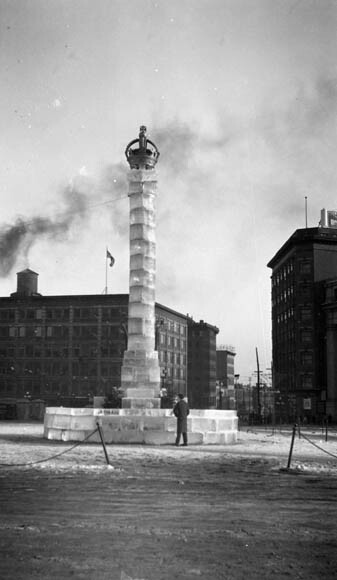 The second attraction was the giant ice column that towered over Connaught Square (now Confederation Square, roughly where the National War Memorial is located) between Union Station, the old Post Office, and the Château Laurier. And the pièce-de-résistance—the ski and toboggan slide. If you were brave enough to venture forward, the chute fell at a daring 45-degree angle which levelled out somewhat before being punctuated by a series of steep dips, rather like a roller coaster. (For more views, see the Flickr album). Lord Byng presided over the first toboggan ride, which held Mayor Plant, prominent businessman A.J. Major, and two others. Throughout the week, daredevil ski jumpers would conduct daily demonstrations on the slide. And the rest of the time, thrill seekers bravely took the plunge on toboggans, racing down and out onto the frozen expanse of the Ottawa River at speeds of over 100 kilometers an hour! 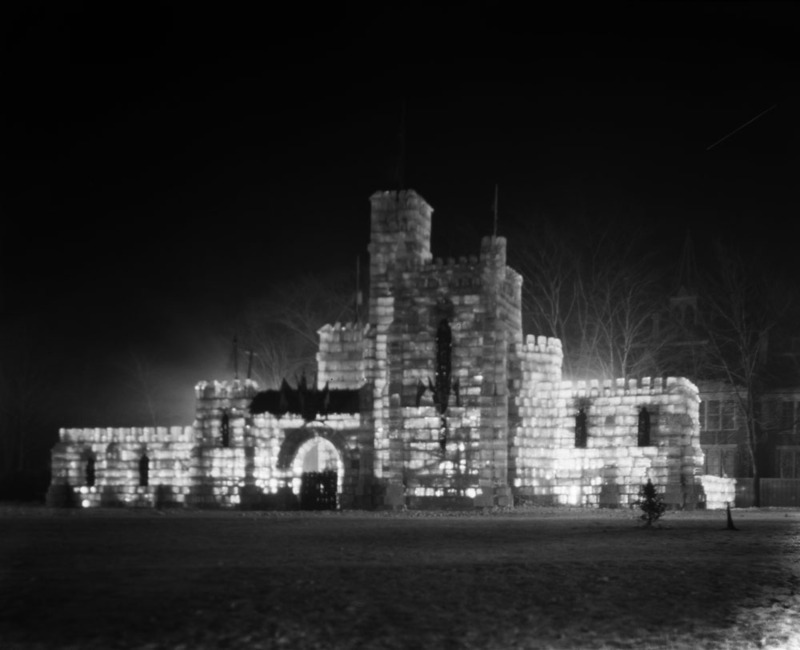 When the week was over, the first Canadian National Winter Carnival was declared a resounding success, with tens of thousands of revelers (the city’s population had only just reached 100,000). The present-day equivalent of the Canadian National Winter Carnival—Winterlude—now garners more than half a million visitors every year. 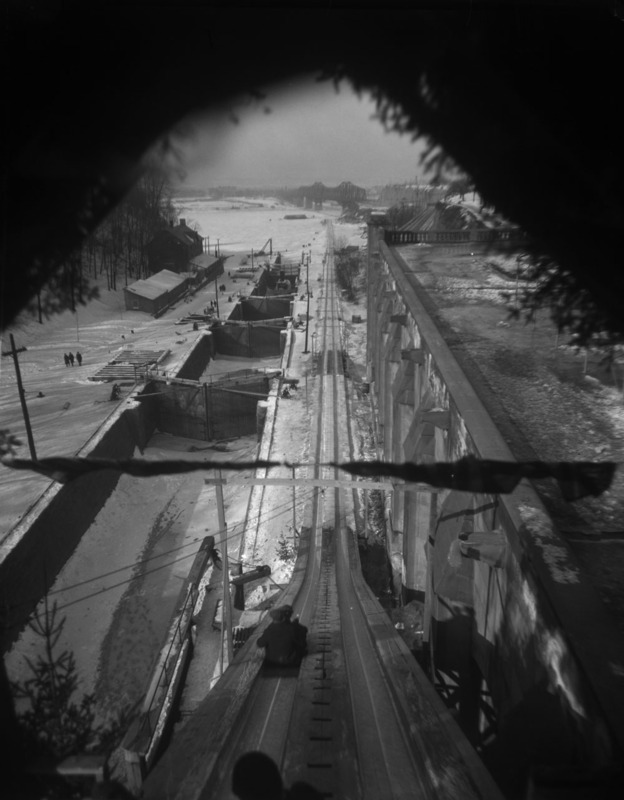 This entry was posted in Our Collection and Facilities, Photography and tagged Ottawa, Sports, winter carnivals by Library and Archives Canada Blog. Bookmark the permalink. Hey, do you need pics of lowertown carnival.